Looking for the next schooling step for your child? Then mark your calendars: Beijing’s biggest and best international school choice fair is rapidly approaching! 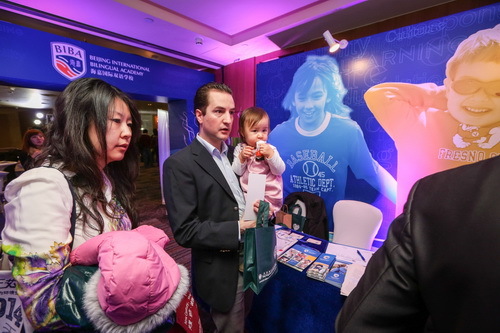 The Beijing International School Expo 2015, brought to you by beijingkids and JingKids magazines, will take place this year at the Kerry Hotel on Saturday and Sunday, Jan 24 & 25. Building on three years of feedback from previous editions of the fair, we’re taking it to the next level this time around with over 70 exhibitors, more lectures and additional play areas for children – all providing one-stop shopping for busy parents who want to check out what Beijing has to offer in terms of international high schools, middle schools, grade schools and preschools. A huge selection of the cream of the crop of Beijing’s international schools will be there – meet key admissions personnel from well-known schools as well as find out about options you may not have known existed. Feel free to bring the whole family to the fair as it will be much more than just your best opportunity to learn about Beijing’s schools all in one place: The Kerry Hotel will have numerous distractions to make a day of it and nearby restaurants will be offering specials so that you can take a break from your school hunting and get a great deal on breakfast, lunch or a relaxing afternoon tea. You’ll also be able to pick up the 2015-16 editions of our Guides – the Beijingkids School Choice Guide (English) and the jingkids School Choice Guide (Chinese), which come out in late January just prior to the event. Two kids play areas: We’re increasing the play spaces so you don’t have to worry about the kids getting bored – there will be plenty to keep them busy, so bring them along! Two days, to accommodate busy families: We know some of you have tons of extra-curriculars, sports and birthdays to attend to each weekend, so we’ve made the fair two days to maximize the chance that you’ll have a chance to visit. Saturdays filled with swimming class and a football match? Come on Sunday. Need to head to church and then a birthday Sunday? Come on Saturday. Stay tuned to beijingkids on and off line to keep up to date with more details on the Beijing International School Expo!